For the past week, I have been volunteering with the NGO, InterVolve. I cannot stress enough how essential InterVolve is for the camps. Beginning in Eidomeni, InterVolve took on the job that no one would: clothes distribution. Since then, they have created an incredible NGO that not only supplies basic needs for refugees in Softex (camp outside Thessaloniki) but also crucial elements to make the foundation of the camp safe. IE providing gravel (vital for when it rains and the ground remains muddy and dangerous for days) on the entire ground of the camp (?!) This one especially blows my mind as it becomes more and more clear the complete incompetence of the powers that be who chose these specific locations for the new camps around Greece. IE providing ISO boxes for vulnerable families within the camp. I am extremely proud and grateful to be a part of this team. I am witnessing every day the irreplaceable actions InterVolve continues to do with minimal support. For all those wondering how to help or where a donation would be most appreciated, InterVolve is 100% the best option. I am seeing it with my own eyes. The month and a half on Corfu is like a distant memory. Remaining is a sense of community, security, love, and friendship. These impressions are now spilling over into my life in Thessaloniki. After 5 hours on a bus and a long walk through the rain I was sitting in the stairwell of the building waiting to be let into the apartment. A bang on the door and on my way to open it expecting to see my renter I was happily surprised to find my friend, Gautama. Gautama and I met over 2 years ago in Brazil where we both worked in a hostel in Salvador de Bahia. Over the years we have kept in touch and only in March began a conversation about the refugee crisis in Greece. A few months later, Gautama and his friend, Morley, were able to come to Thessaloniki where they have spent the last 3 months gathering information about the situation here. I have hit the ground running. From catching up on all informations, stories, and scenarios from Gautama, Morley, my friends in Oikopolis and more to volunteering in Softex (camp outside of Thessaloniki) to aiding in teaching English classes there has been very little time to process any thing. However, the hectic pace has seemed to have a positive effect on my overall mentality. I returned from the camp to Thessaloniki around 6pm yesterday evening. Even in my two-day-in-a-row clothes and muddy shoes I went directly to Oikopolis to visit Gautama and observe his English class. I cannot emphasize enough how much I love Oikopolis and the people involved there. Gautama’s class was preparing for a new activity when I arrived and he looked to me for ideas. We conducted a simple “20 Questions” type of game, having students write the questions in English on the board and try to guess different nouns. It was a blast. A new activity was started and I went to speak with a friend I had met in April. He told me he had received the call to be relocated. It was certainly something to celebrate. “Tears of joy,” another friend said after coming out of a long and emotional hug with our friend with the good news. I will never forget that hug…and I wasn’t even a part of it! Another wonderful dinner and conversation with Gautama and Morley and then I finally headed home. The apartment where I am staying is on the 5th floor of an old and beautiful building. Long french doors open out onto a small balcony and I leave them and the shudders open during the night. I looked around the room and out into the living room where my host had several friends sitting fairly occupied around the table. I went out onto the balcony and looked down at the street but no one was around. I look straight up and directly across from me to find two of my friends from Oikopolis standing on the balcony. Listen, Thessaloniki is a big city! With thousands of apartment buildings going up to even 6-7 floors. To find my friends living precisely on the same floor in the building across the street was a true feeling of elation. The reassurance I get from time to time that I am exactly where I am supposed to be. Of course I ran over the visit them and bask in the beautiful coincidence. We stayed up talking until 3 in the morning about a thousand and one things. My blogs from here will always attempt vagueness because names and places are necessary to be private for many reasons these days. However, I hope once I get back into writing more I am able to share in more detail the events and situations happening here. During my 12 years in this city that song has been a constant every Saturday morning. Somehow the same sense of excitement and happiness surfaces within me as it did the first time I heard it. Yolanda Estrada was like a shaman guide of music for my friends and I during our early New Orleans years. Yolanda’s voice will breach the music to tell us about salsa in the city, what music she’ll play that day, and other topics. Every Saturday her soothing voice would fill our house and prepare us for some magical New Orleans day. I’m not going to lie, this has been a difficult year. Majority of the time I have been in a hopelessness that I attribute to witnessing the injustices of the refugee crisis, and feeling like I have absolutely no control, ability, or voice to help any one. However, the past couple weeks have begun to lighten my spirit…slowly, but surely. Maybe because I know that soon I’ll be back in Thessaloniki and continuing to help in every way I can. Maybe simply because I heard “Tiene Sabor” this morning after having a few days with these incredible women I met 12 years ago…12 years ago when we only needed to hear Yolanda Estrada’s voice to feel grateful, comforted, and hopeful. This is for New Orleans and the incredible people it has brought and continues to bring into my life. The flavor of New Orleans is a feeling that I feel so lucky to have tasted. Now that I am officially back in New Orleans I wanted to say another really big thank you to everyone who donated and supported me going back to Eidomeni. I am also SO thankful to the Refugee Solidarity Movement Thessaloniki, my Eidomeni BFFs, Oikopolis, and of course my personal support friends/family in Thessaloniki. As I posted while I was in Greece a lot has changed in the camp. The future for the 10,000+ people in Eidomeni is uncertain as well as for the 50,000+ in all of Greece. The only constant has been the incompetence of political planning and organization. I guess all we can know for certain is that the system will continue to disappoint. On a positive note, I amazingly feel very satisfied with my time there. With the help of my previous volunteer friends I met in November and new more incredible like-minded people I met only this month, all together we were able to provide relief all around. From over 1200 reusable cups, to hundreds of sticker books, balloons, markers, clothes, and bus tickets, with other volunteers I was able to directly be of service. Some of us would even say the obvious, “Just imagine if every one person, helped every one person here…” and I did see that happen a lot this time and it was a beautiful thing…but at the same time, disheartening because there are just so many desperate people. When I arrived the RSMT (Refugee Solidarity Movement Thessaloniki) was beginning to discuss new types of services to provide. The tea tent idea had spread and plenty of independent volunteers were taking the reigns for this duty. Luckily, I was able to distribute tea with the group 3 times before it was decided to take a break and start brainstorming. Of course the idea is to provide more possibilities for independence. Whether in crafts, sewing, teaching, dance, or music, RSMT is prioritizing to create productive activities for the refugees. This is what is in the works for the next couple of weeks. I am sad to be missing it however, it has never been more clear to me that MY priority is to be a part of the plan eventually. Therefore, I am in the works of legitimatizing a long term stay in Thessaloniki. Even though by the time I am able to return, Eidomeni will probably be completely evacuated and refugees will be sent to the various camps within Greece. During my time there, camps were popping up every where. Especially in various areas around Thessaloniki. This is where the RSMT are focusing for these efforts because the smaller camps (3000 people) are more stable…most of the time. As I continue to be in contact with this group, I’ll be updating on the process. I could not have asked for a more perfect layout of my stay in Thessaloniki. As my first night I arrived happened to be Craig’s (Organizer for RSMT) birthday party, where I reunited with and was introduced to all the amazing people who participate in this group. Then of course my last night (which I actually postponed…hey, I needed those two extra days in Thessaloniki!) was the 3 year anniversary for Oikopolis (the non-profit that basically is an umbrella for many groups working out of Thessaloniki.) Everyone was there. It was such an incredible event and really nailed in the feeling of where I belong. This little guy. Hit in the head with a rubber bullet on Sunday, he was back again testing the limits by being this close to the confrontation today. I had some balloons and gave one to him. He continued closer to the fence, but far enough not to be in danger. He had blown up the balloon and kicked it. It rolled through the grass as he picked up some small pebbles and threw them towards the chaos. Then he marched over and with such force stomped on the balloon. POP! Typical boy stuff. He came back over to us and we asked him more about what had happened to him Sunday. At first, he had joined the guys in the protest. Then after he saw our faces of disapproval changed his story to say that he was an innocent bystander. All of our misunderstood words and lectures about how he should stay safe and not participate or get close to this kind of thing were thrown aside. However, after some silence, I thought I’d try one more thing. I opened my bag and pulled out some markers. “Do you like these?” *Eyebrows raise* I had caught his interest. I gave him a pack of the markers (I brought 5 packs just in case…) and we examined the unique colors and pretty legitimate quality. “The other big!” he said with an authentic smile. I felt as if I was in a parallel universe in that moment. Tear gas is being tossed yards away and we were focused solely on the coolest markers ever. Luckily that morning, amazing Oikopolis people had found me a notebook (perfect for a young dude like this one) so he was all set. Once he had the book and said his thank yous, he began to walk back into the camp miming to us that he was going to his “home” to draw. On my drive to Eidomeni on Tuesday I was listening to the radio. Mostly, I am stuck with top 40s or Greek songs which I actually enjoy as being in the camp can be a type of work out. What better music to pump yourself up than top 40s? However, this afternoon while I was scrolling through the hundreds of stations I was happily surprised to find some Dixieland jazz. The host’s voice came on afterwards and mentioned, “Νέα Ορλεάνη” and a sense of pride and appreciation for my homeland came over me. With every verse, tears grew in my eyes. It is a song that pertains to so much of the world right now and at that moment, for me, a song for the refugees. I had this conversation with one of my closest travel companions. After travelling together for almost a year throughout 10+ countries his encouragement and opinion means a lot to me. I have been overwhelmed with the support in my endeavor to return to volunteer at Eidomeni Refugee Camp. Overwhelmed to the point of a new fear manifesting…expectations. As I have had to explain many times, the situation in Eidomeni, and in the majority of camps in Greece, focus on immediate relief and aid. The situation is changing every day, every hour…after criticism on this front of there not being a “long-term goal,” I have begun to stand more firmly in support of my friends who are volunteers and/or working with the NGOs there. Government presence is only in the form of police or military, and the EU-Turkey plan has already proven in some cases to completely disregard basic human rights. This all comes down to a big THANK YOU. Thank you for supporting me with your donations and messages. Thank you for giving me the opportunity to grow. I’ll be back in Thessaloniki in just a week and here on the blog I will be posting updates. 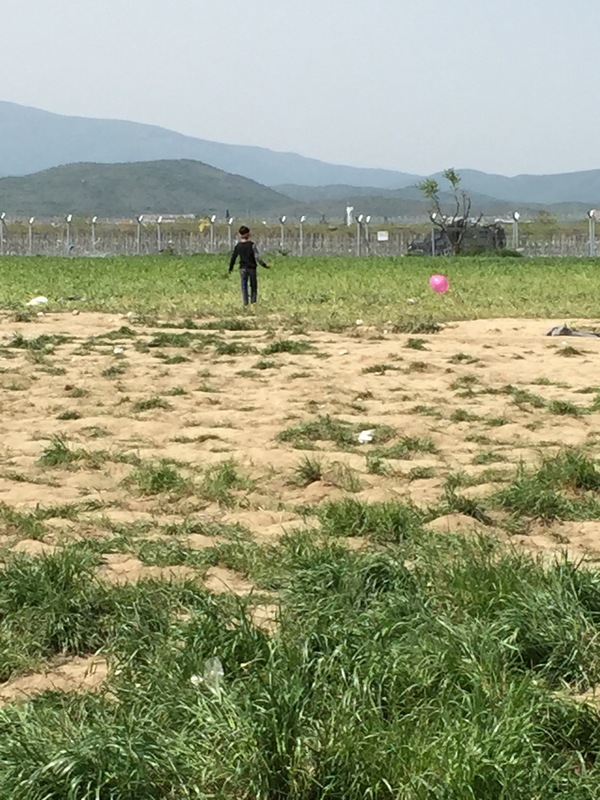 As most of you have seen, Eidomeni is in a very sad state at the moment due to the closing of the borders. Greece is being left alone (by the EU and the WORLD) to help thousands of thousands of desperate people and families. There are horrific events happening all over the world, and maybe I’m biased to this situation because I have been to Eidomeni, met these refugees, and grew a strong sympathy for their stories. Maybe it is because I love Europe, and Greece in particular, and I am ashamed at how the rest of the EU is handling this situation. It is all infuriating, sad and SHAMEFUL. However, I am beyond grateful for the Greek, English, American, Austrian, Egyptian, and several other international VOLUNTEERS who continue to stay at the frontline giving any and every possible comfort and aid to the people stuck in limbo. 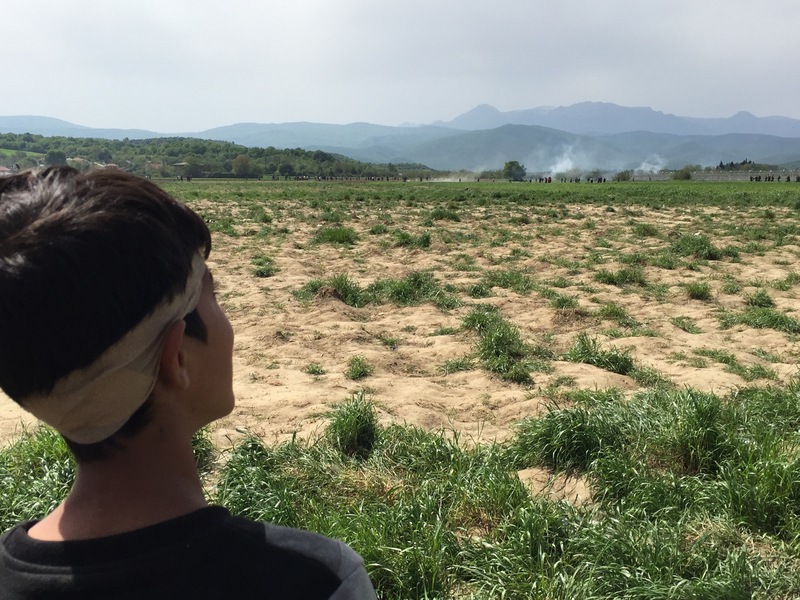 Specifically, the frontline of Eidomeni where only TODAY children, women, and men were tear gassed after several cold days and nights of waiting, hoping for the borders to reopen. Please continue to help me get back to work alongside my friends and to be able to provide a donation to Oikopolis who not only host my beloved Refugee Solidarity Movement Thessaloniki group but also organize several distribution factors (food, clothing, and various other supplies) to the refugees at Eidomeni. Lots going on at Eidomeni right now as the the rules continue to change with the whim of a phone call or official letter. “Close the borders for that specific group of people.” Who have travelled so far and for so long only to get to a barbed wire fence and intimidating military police blocking the entry. The most infuriating and frustrating thing about this repeating scenario (it happened in my time there when it was decided to only let Syrian, Iraqis, and Afghan citizens through the FYROM border) has been the lack of a “plan B.” The people who make these rules have no regard for the thousands of lives that these decisions affect. The thousands of lives of the refugees AND also the volunteers who are then overwhelmed in hosting/providing adequate supplies for the people stuck at the camp.